Local campaigns can get ugly. Negative ads, outside groups, and social media are often employed to tear down a candidate’s opponent. Very few campaigns sink to the level of Maria Olsen Nate. 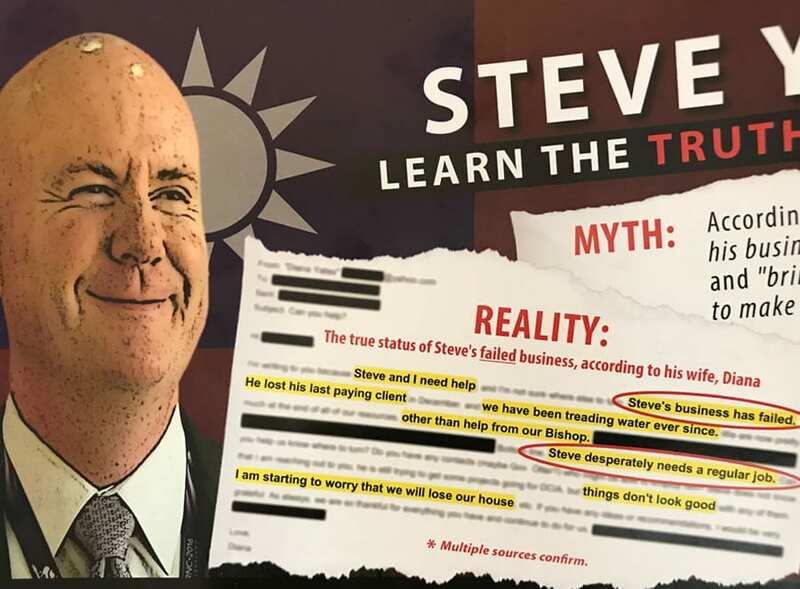 A statewide mailer was delivered to residents of Idaho urging voters to look at Lt. Governor candidate Steve Yate’s record. They accused him of having a failing business and included a copy of a private email sent from Steve Yate’s wife to her friend Sheila Olsen, a beloved active member of the Republican Party. The claims made by the mailer were dubious at best and upon discovery of who paid for the mailer – a group funded by Doyle Beck and Bryan Smith, it was obvious this may have been part of a longstanding grudge match between the leaders of the Bonneville County Republicans and the former Idaho GOP chairman. The most troubling aspect of this was the source of the email; Sheila Olsen’s own daughter, Maria Olsen Nate. Maria Olsen Nate is running her husband Ron Nate’s campaign and has been his voice in public since he was first elected. There is no separating Maria from Ron’s campaign. This is especially difficult for Ron who may have a hard time disavowing his wife’s actions. Nate went on the Neal Larson show this morning and was confronted by her actions. She said: “I disavow it, it’s not appropriate, and we should not campaign like this. If people want to be mad at me I will take 100% of the responsibility for this.” She went on further to say that this should not be a reflection of her husband’s campaign. There is a problem with this. You see Maria is Ron Nate’s campaign. Every comment, post, like and share is done by her and her group of friends she activates to boost social media engagement. Just about everyone in Madison County knows that Maria is their unelected representative. Saying this is not a reflection of her husband’s campaign is highly disingenuous. For as much dancing as she did around the issue, it may be obvious to most that this was politically motivated, designed to please their donors and hurt her enemies. If she was willing to breach her mother’s trust and share this email, how many other private messages did she find and forward? Will there be other mailers attacking other candidates that do not align with her hard right-wing politics? It’s a fair question. When you look at Maria and her husband’s record, this appears to fit a pattern of behavior, one where the rules do not apply where winning seems to be all that matters. If Maria Nate wants redemption from the community and salvage any chance her husband has at reelection, she needs to come clean and share the email header containing the name of whom she forwarded it and verify that no other emails were forwarded from her mother’s email to other parties by her. Ron Nate should probably return any donations from anyone associated with paying for that terrible mailer. Madison County residents will be disappointed in the Nates after this. Relationships have been damaged, friendships tested, and until they make things right, bridges in the community will continue to burn.